Formerly derelict facades are frugally restored by Gwynne Pugh Urban Studio. Prada, Fendi, and Louis Vuitton may resort to starchitecture to lure moneyed customers to Rodeo Drive and Madison Avenue. But what can high design do for a pet store, a nail salon, or a store called simply “American Clothing”? Plenty, the city of Long Beach hopes. For decades, four low-slung, ordinary commercial buildings at the corner of Anaheim Street and Long Beach Boulevard have been decaying along with their surroundings. The city identified the buildings as both a symptom and a cause of a cycle of blight that qualified the area for federal Community Development Block Grant (CDBG) funding. ago to give the corner a new look, funded by CDBG money. “Our idea is to look at corners or nodes where potential business development can happen,” said Alem Hagos, the department’s grants administration officer. Santa Monica–based Gywnne Pugh Urban Studio won the contract. Work was completed late last year. 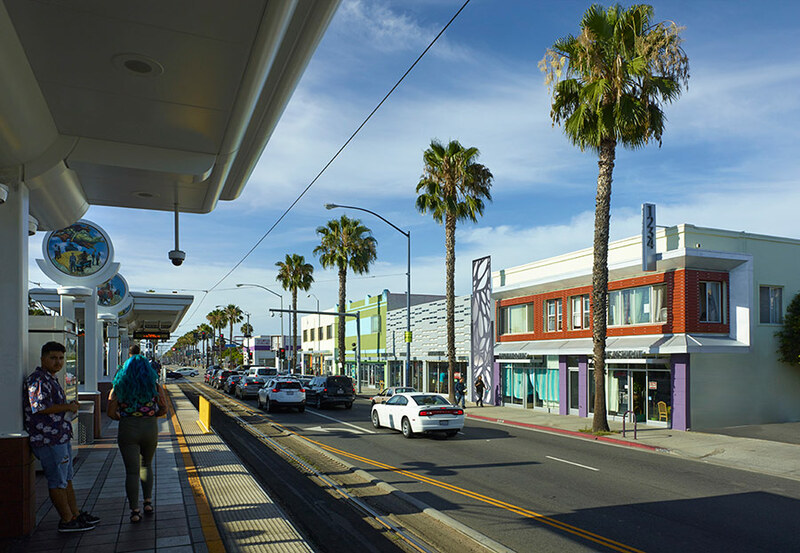 Before: Existing streetfront as seen from a light rail stop in Long beach. Pugh took a different approach to each building. The second and fourth buildings from Anaheim Street got whimsical paint jobs of turquoise and purple. Pugh extended the facade on the third in a move reminiscent of an Old West storefront. As a unifying element, Pugh designed a steel canopy that spans the four facades. On a blank wall along Anaheim Boulevard, Pugh commissioned graffiti artist Hector Calderon to install a mural that will, he hopes, not only create visual interest but also discourage tagging. The design work required a level of creativity that often comes only from financial constraints. Pugh had a design and construction budget of $404,000. Though upgrades are strictly cosmetic and largely two-dimensional, the project’s benefits are intended to radiate beyond the buildings’ footprints. The area lies across the street from a Blue Line light rail station, making it something of a welcome mat for commuters. While other commercial buildings throughout Long Beach—and all along the vast low-slung boulevards of the Los Angeles Area—are too numerous for such extensive upgrades, city officials hope that Pugh’s design will inspire landlords to make modest investments. This potential for community-wide inspiration makes the project worthwhile for Pugh, even if his firm’s contributions are only cosmetic and the profit margin slim. “While I enjoy designing buildings from the ground up, it’s a really interesting challenge to work with the neighborhood, to take its best qualities and really create character,” said Pugh. Long Beach residents may still need to travel for their leather handbags and silk scarves. But now they have something arguably more important: an inviting place to get a pet, a pedicure, or a pair of Levi’s.